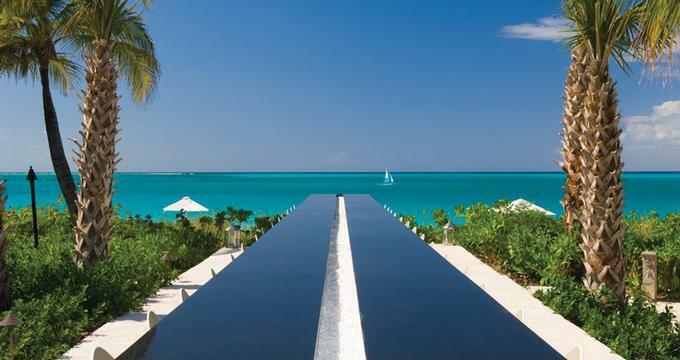 The Grace Bay Club is a Caribbean island getaway located in Providenciales, Turks and Caicos, British Virgin Islands. The hotel has a beautiful beach where you can spend your days relaxing in the sun and enjoying watersports in the turquoise waters of the Caribbean Sea. The hotel will provide you with snorkeling equipment, kayaks and canoes to explore the coast. Providenciales island is a scuba diving, deep-sea fishing and golf destination. The Anacaona Restaurant features open-air tables overlooking the Caribbean sea. The restaurant serves fine Euro-Caribbean cuisine and is especially romantic in the evenings when candles and tiki torches are lit. Live dancing under the stars is offered several times a week. Anani Spa offers a variety of treatments with European and Asian influences. Treatments include aroma stone therapy, couples massage and Japanese silk booster facial. Book your spa treatments early - you can always cancel if you change your mind. Spa facilities include six treatment rooms, including a couple's room, a manicure room and an area for facials, massages or body treatments. An outdoor spa tent is available for beachfront massages. The Fitness Center offers everything that you mind need for a great workout, from cardio machines and free weights to an outdoor pool and yoga mats. The villas are great for families, offering generous layouts and five star amenities. There are 38 suites at the Villas, all with ocean views and from 600 square feet to 6,340 square feet of living space. There are four five-story villa buildings on the property. You can choose from Junior Suites to spectacular penthouse suites. The suites are individually furnished with hand-picked furniture from around the world to create a calm and refreshing environment for your island getaway. Accommodations at the Hotel are only for guests 12 years old and older. American breakfast is included in the morning. A dedicated Personal Concierge will make sure that all your wishes are met. Junior Suites: These suites consist of an oceanfront bedroom with king bed, kitchenette, terrace and high-tech amenities. Luxury One Bedroom: The 1,300 square foot suites have a king bed and spectacular ocean views. They can accommodate 2 adults and a child over 12. Grace Bay One Bedroom offers a similar layout. Luxury Two Bedroom: This suite can accommodate 4 adults and one child over 12 years old. The spacious layout dives you 2,238 square feet of living space. Grace Bay Two Bedroom is slightly larger and offers stunning ocean views. The property offers seasonal deals and great packages for couples and families. Save 15% Last Minute Deal: receive a 15% discount when you book stay within 20 days prior of arrival. The deal also includes breakfast and free internet access. The "Couples Getaway" starts at $500/night in a Junior Suite and includes a free night plus romantic amenities like champagne bath, chocolate dipped strawberries, and one breakfast in bed. Plan your dream Caribbean wedding on the beach with one of these packages which range from $2,700 to $12,950. The "Just Wedding" package starts at $2,700 and lets you tie the knot right on the beach (or in a gazebo, if you prefer). The Grace Bay package (from $6,700) includes additional amenities such as a cake, photographer and pickup from the airport. The $12,950 package includes massages, Dom Perignon Champagne, wedding band, video of your event and other luxuries. Suites start at $425 per night from April through mid-December, and from $725 from January through March. Spa, honeymoon and other packages are often available. The resort is located 575 miles southeast of Miami Florida. American Airlines offers three daily non-stop flights from Miami and several flights per week from New York City. The hotel provides complimentary airport transfers.